Home > Quality & Calibration > Quality Assurance Signs & Tags > Colour-Coded Quality Assurance Signs > Bonded goods area sign. Quality assurance signs, labels and tags. Part of our quality assurance (QA) and calibration range. 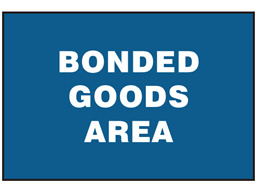 Bonded goods area sign. Rigid plastic. Colour coded quality assurance signs. Bonded goods area. ZS1340 Size 150mm x 300mm. Material rigid plastic. ZS1341 Size 300mm x 450mm. Material rigid plastic.